On examination of this eye you simply cannot find a pupil through which to examine the retina. What is going on, what might have caused it and what treatment might be worthwhile? Ophthalmologists woud say that in this eye the pupil has been lost. It suggests severe inflammation in which the edges of a tiny miotic pupil have simply fused together. Notice the dark iris and the white masses – probably old fibrin clots. In fact the globe is considerably smaller than the contralateral eye and the intraocular pressure is only 3mmHg while the pressure in the other eye is a normal 15mmHg. The eye is undergoing phthysis and no return to vision is possible. Anti-inflammatory medication to ensure freedom from pain is important as are antibiotics to maintain orbital sterility. 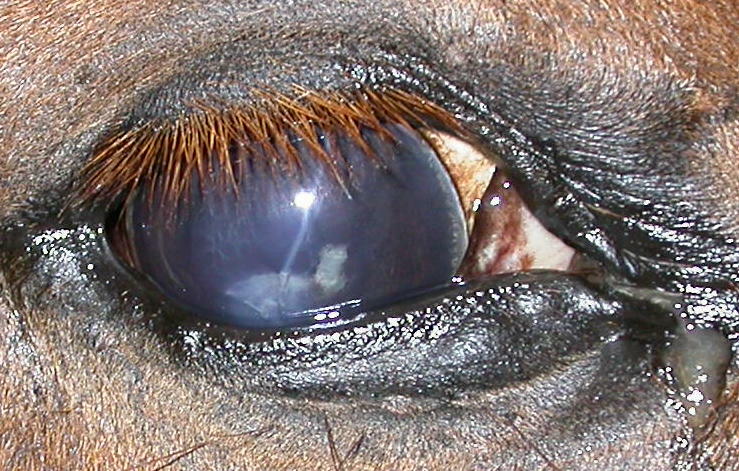 This entry was posted in Cases and tagged Horse, uveitis. Bookmark the permalink.